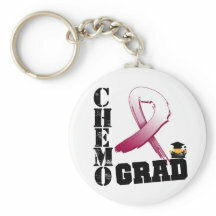 Today I am a CHEMO GRAD!!!!!!!!!!! 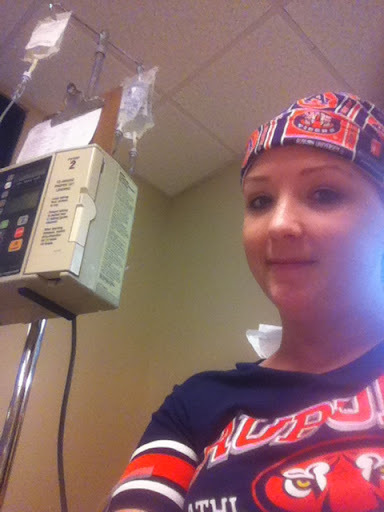 Yes, today – August 28th, 2012 – I had my last visit to the chemo room, as a patient. I may stop by and see the wonderful nurses when I’m in the offices for a check up, but other than that….I spent my last time in the chemo chair! PRAISE BE TO GOD! I cannot tell you how my heart feels. There are no words. I am so happy. Of course, for the next couple weeks I will experience the side affects, but I know as I’m going through it that THIS IS IT! :o) Woot Woot! My parents went with me to my treatment today. It was so nice to have them there. They got up VERY early this morning so we could leave at 7AM this morning to drive the 2 hours and 15 minute (it was longer due to stopping for gas and morning traffic) drive to the Sarah Cannon Cancer Center in Nashville. My counts were okay. My WBC count was 6,500…they said they like to see it higher, but since I’m going to have the Neulasta shot on Thursday I should be okay. I am also a little Anemic. My RBC count was 3.8 and the lowest of the good range is 4.04, but they said it was okay. I was actually feeling really good so I surprised my RBC count was low, but I see that my thyroid was VERY high and he didn’t even mention it. I only noticed it because I asked for my records. I had my thyroid radiated in 2004 due to Graves Disease so I have no thyroid anymore…the radiation killed it. I do not take my thyroid medication that well. So, I am pretty surprised. I am taking it better though since the doctor suggested putting it on my nightstand and taking it before bed. I actually remember now. :o) Maybe the thyroid grew back from the chemo treatments. LOL! Anyway, they confirmed that my burn on my hand was from the taxotere chemo drug, but it is so much better today that they aren’t worried at all. I will try to take a picture in a few days. I forgot to mention that I did stop by their office last Tuesday to talk to them. I had to see a chemo nurse because they were gone for the day. She said it didn’t look too bad at all and to just keep putting Aquafor on it and keep it out of the sun. The doctor told me that because I was on the Doxycycline it really helped it to not become worse. Big Praise! I talked to him about my hot flashes and how they are driving me crazy and messing up my sleep. So, he gave me Megestrol (20mg). He thinks he will help and has promised it won’t contribute to my weight gain (since it is such a low dose) even though a side affect is weight gain. The doctor also confirmed that I will be going on Tamoxifen soon. I told him I wasn’t sure I wanted to be on it, but I will try it. I just feel like if the side affects are bad I might be okay with declining it. I don’t know. My biopsy was only 20% estrogen positive. I will have to take it a total of 5 years (2 full years, try to have a baby for 2 and then 3 more years). I am concerned about weight gain and hot flashes….well…and of course I would like to try for a baby sooner than 2 years. But, I guess I can always pray for a miracle adoption. :o) He told me that tamoxifen won’t make me gain weight or have hot flashes. I’m going to ask a few of my friends that are on it and do a little research though. Also, I want a little time to go on a diet/exercise first before I start it. He wants me to wait 3-4 weeks to start my diet, but I can start the exercise now, on my good days, if I don’t over do it. Last week I did go for a couple walks. One was almost 2 miles. I thought that was great for someone on chemo. So, at 11am I was sitting in the chemo room…waiting in the chemo recliner for my IV (note: GET A PORT if you ever have to do chemo). It is funny because they are doing construction in the building so every time I come in for chemo the room is totally different. It was nice today because I found a recliner with 2 guest chairs! Normally, each recliner has only 1 chair because you are only allowed one guest, but I asked and they let them both stay with me. :o) It was a blessing! The nurse was great and only had to stick me twice to get blood! YAY! It worked on the 2nd try. I know there were some praying about this so thank you so much! My eyes were actually tearing up already the 2nd time because I was a little scared that we were going to have a replay of last time…but God was gracious. We met many sweet chemo patients today. It was a great way to end my treatment being able to talk about our stories together. I gave them my card and I hope I can keep in contact with a few of them. I got their first names so I could pray for them and I hope I hear from them so I know how to pray specifically for them and because I will always wonder how they are doing. It was not their last treatment and have different cancers. :o( So, they will need much prayer. At 2:30pm we were talking out the door…..so happy that this was it! I’m a chemo graduate! Another thing I can add to my list of experiences. I’m glad I will be able to truly say that I understand what someone else going through chemo is going through. It is rough! But, the Lord walked through it with me and when I prayed (and you prayed) He answered. What an Awesome God we have. A personal God that loves us so much. Jayde getting chemo. Celebrating SEC football starting on Saturday by wearing her Auburn University head covering (it was a sweet gift), earrings and shirt. WAR EAGLE!! I was pretty out of it after chemo and very drowsy, but I wanted to celebrate so we went to Red Lobster for a late lunch. It was so good, but the last two chemo treatments I’ve had a weird thing happen when I eat. My throat won’t swallow without me concentrating on it. I know, it sounds weird. I had to pause and think in order to swallow my food sometimes. Strange! Also, my mom hinted to the waitress that this was my last chemo day and she brought me a cheesecake with chocolate drizzle and it was VERY good. Thank you Red Lobster! We arrived back home at about 6pm. I was tired and I have 3 boxes of apples (about 60) that need to be preserved before my side affects get too bad. My father-in-law was gracious and let me take what I wanted. His apples are SO GOOD! They are organic since he doesn’t use any chemicals or sprays on his trees which is so great. My dad did most of the work for me on Sunday by picking them, climbing the ladder and fighting the bees. Thank you both!! I did help to pick some and paid for it the next day with muscles spasms at the top of my right tissue expander. Luckily, it was only bad yesterday and has not been too bad today. It was VERY sharp pains yesterday. It was fun to throw a few of the bad ones to the cows and donkeys (the horse was MIA at the time) and watch them eat them. One of the donkeys let me hand feed him. :o) They are pretty small apples so I don’t think they will take too long to process, but it still requires energy. I have a magic apple peeler, corer and slicer…it does all 3 at the same time! The magic apple tool makes it go very fast. So, tonight I did 26 apples while sitting at the table (I will finish the rest in the next few days). I would put them in a solution so they wouldn’t brown since I was VERY slow I didn’t want to miss this step. Then, I blanched them for 2 minutes, vacuum sealed them, labeled them and froze them. I was able to do 17 cups tonight (3 bags of 4 and 1 back of 5 cups). I’ll be able to make pie, cobbler or other dessert with them later. I have been so blessed during this journey with so many giving people. We were ready to put our garden in the week I found out I had cancer so we decided not to have a garden this year. YET, God provided. I was able to preserve tomatoes, green beans, okra, apples and one other veggie, but I can’t remember right now. LOL! My brain is so fried. So, with that….I can’t type anymore. I’m going to bed and praying that I can sleep tonight despite the steroids they pumped into me today. Love you all! God bless you. I’m sorry for any typos or sentences that don’t make sense. A friend of mine, who’s initials are WDB confirmed that I have a double-chin and that I’m starting to look more like him everyday. Thanks WDB! Thanks a lot. lol!! Normally, I don’t start my posts out with scripture, but today I felt like I needed to. Two things have really been speaking to my heart this week. First, the scripture above. I am nearing the end of my treatment and looking toward to my new title of “cancer survivor”. I am thinking back through everything I’ve been through, seeing the many ways God worked in my life. I believe He has allowed me to have complete healing, He has shown me the joy that comes from those that care, pray, give gifts, give time and just love on me. It is amazing how loved I have felt through this journey. Also, I’ve been changed. Not just on the outside with my scars and reconstruction, but my heart has been changed. I’ve been changed on the inside and I am so thankful for it. When I read through the Bible in a year I remember praying a prayer the entire time I read it. It was a certain prayer that I can see playing out in my life right now. Little by little. It is funny because I prayed the prayer a “certain way” and was kind of specific and God is answering it in a totally different way than I could have prayed myself. But, a better way. I hope one day soon I will let you know what this prayer was and tell you how God molded me and made me more bold in my faith in order to answer this prayer. I’m still waiting for it to all unfold. But, I read the verse above during one of my quiet times this week and it really spoke to my heart. Make sure as you are going through something that you watch to see how God is changing you inwardly throughout the struggle. Pray and ask God to help you stay focused on the eternal glory and not just the daily struggle. This life is but a blink of an eye compared to eternity with Him. Our focus needs to be on what is unseen. When I first started this blog I was trying to decide how I was going to go about telling my journey. Should I talk about God? Should I mention Jesus? What about certain personal things? Would people be offended if I discussed religion? I know many people that have blogs and they try to keep religion and politics out of it as not to offend. Through prayer, I realized that without God, Jesus and religion it wasn’t about me. It was just a blog shell of some anonymous person with breast cancer. My daily life IS about God, Jesus Christ and the Word of God and without these things it wouldn’t be a blog about Jayde. So, I decided to be honest and to tell whatever was in my heart. I have received a few comments since I started this blog. People that didn’t agree with me or were upset that I posted verses or talked about the Lord, but in the end…I know I made the right decision. Their criticism or opposition was minimal compared to how many hearts may be changed, comforted or lifted up due to my openness. So, if you are offended…..I’m not sorry. lol! This is about my life and my struggle…and that is what is in my heart. My little blog has had over 13,000 hits in the past 4 months. That is crazy! 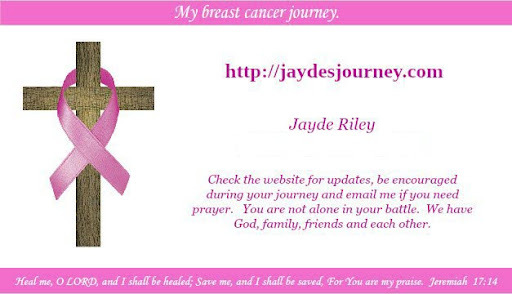 My prayer from the beginning was that this blog will be a help to those that are living through a breast cancer diagnosis and that every woman (or man) would realize how much help the Lord is, to allow Him to walk with them through the journey and to be changed in the end. 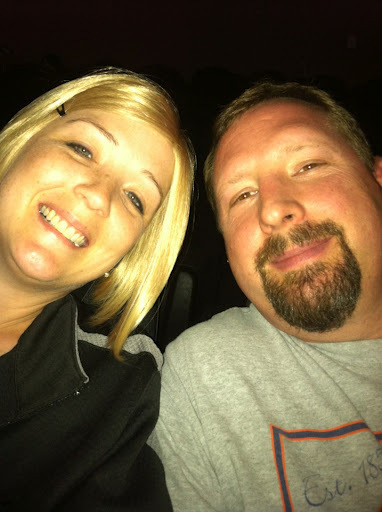 Also, not related to my blog, but to how Kevan and I fell in love…if you are single and looking to find a spouse….Ravi Zacharias has a wonderful series called “I, Isaac, Take Thee, Rebekah”. Also, I believe he talks about it in his interview, here. It is even a good series for those that are married. I might have to talk Kevan into going through it with me again…just to bring back the dating memories of when we listened to the sermons together. I loved the audio version. I don’t think there was a book then so it would be fun to go through it. His book “Walking from East to West” is also a great book about his life. I listened to the audio version and loved it. Love you all and I pray you will all be blessed this weekend! To God be the Glory! Good morning! It is a great morning! I am starting on my 3rd week after my 3rd chemo and feeling pretty well. I love getting up in the morning when I know my brain is working a little better and the chemo fog is at bay. I had enough time to study God’s word, enjoy His creation (our barn kitten playing, bunnies, birds) and drink my coffee. Right after chemo I can’t drink coffee for about a week and I sure do miss it. The 2nd week after chemo I can drink it, but it doesn’t taste right so I don’t really enjoy it. The 3rd week….it tastes good again. Mmmmm! It was good this morning! I was finally able to drive a little over the weekend. I had the opportunity to go to a Women’s meeting at church yesterday and a baby shower at church. It felt great to drive myself. Once I was there for a couple of hours though I was getting pretty foggy brained and felt like I might have to call Kevan and my dad to come get me, but by the time I left I felt better. The chemo fog seems to come and go throughout the day. It still seems to mess up my vision as well. I am still having to take Claritin for the bone pain from the Neulasta shot. I can tell when I miss a dose so I know it is working. I forgot to take it before we left for church yesterday and I had quite a bit of spine and chest pain. If I was smart I would carry it in my purse. My fingers and toes are pretty sore still. My computer has hot air that blows out the right side of it. So, if I use my mouse next to my computer it really makes my nails hurt (immediately) if they get hit by the hot air. They are so sensitive. I’m thankful I have all my nails still though…some women I know lost a nail or two during treatment. One thing that we’ve noticed after this last treatment is how fat and round my face is getting. I’m guessing it is the steroids and I’m praying/hoping that it goes back to normal after my last treatment. I was going to post a picture….but I’m not that brave. lol! 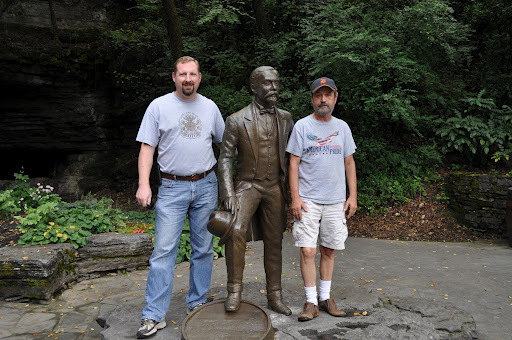 We took my parents to Lynchburg, TN Saturday morning to go on a free tour of the Jack Daniels’ plant and learn about the history of the area. I was worried at first that I wouldn’t be able to keep up with everyone, but I tried to sit and rest whenever there was an opportunity during the tour and it worked out great. If you are on chemo you might want to skip the tour…the smell inside the plant was making me sick. I just tried not to breathe whenever it was smelly and I made it through it. We also drove by the area where Davy Crockett lived when he was there and visited the little town square. I love history. Anyway, I wore one of my wigs all day. I don’t know if it was the heat or what, but I developed a rash on my head. So, I don’t think I will be wearing a wig for a few days. It hurts. Here is a pic of my dad and Kevan with Jack Daniels. Below is a picture of my hand. A few days after my last chemo treatment I developed this chemo burn. I read some things online and it sounds like the Taxotere (chemo drug) leaked out of my vein which caused the burn. It is pretty painful…just like if I burned it on the stove. 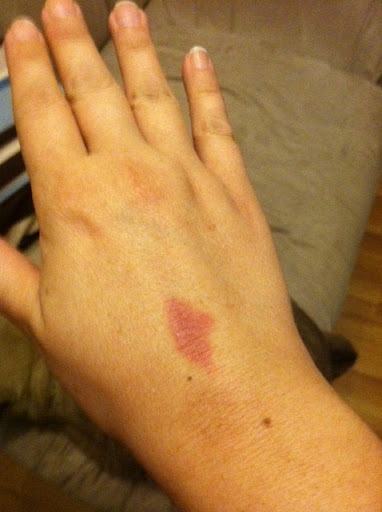 A woman online said that her hand scarred pretty bad from her burn so I’m praying mine does not scar. I will talk to my oncologist about it when I see him next Tuesday and also about how to prevent it next time. This is the arm that I already have signs of lymphedema in and I am not supposed to injure my arm….so hopefully the lymphedema does not worsen due to this. What have you learned from Jayde’s experience? If you have to go through chemo GET A PORT! Kevan and I are leaving for Nashville tonight for a couple appointments I have tomorrow. I will be having my 3 month checkup with my breast surgeon who did my mastectomy. I can’t believe it has been over 3 months! Also, I’m going to try to get fitted for my compression sleeve and meet with the lymphedema specialist at my surgeon’s office. I just want to get her opinion on how I’m progressing. Again, thank you all for your prayers. God blessed me this chemo treatment. It wasn’t as bad as the first 2! My parents arrived here late Saturday night and it has been wonderful to have them here. We enjoyed church together on Sunday and we’ve been able to sit around and “visit” together. I love having my mom to comfort me and help me with things around the house and my dad has been able to drive me to my appointments or to the store to give Kevan a break. I’m thankful that they came all the way from Michigan to be with me. My mom has been cooking up some comfort food for us (potato chowder), doing my laundry for me, cleaning the kitchen, etc. It has been so nice. I took a bath yesterday morning and when I went into the bedroom to get dressed my bed was made. It was the best feeling. I couldn’t wait to crawl into it in the afternoon and take a nap. It was so inviting. Thank you mom! I’m happy to say that I only have 2 more PT sessions left. Thank you to any who prayed for my scar banding/cording from my mastectomy. The banding/cording is all gone and I have full motion in my arms again. Praise God! The therapy seemed so slow at first, but it has improved so much. The ladies at the PT center took great care of me and I am so thankful for them and their knowledge. They pushed me to do my exercises (which I am so bad at) and I’m thankful for that too. It is so great to sleep with my arms above my head again and not wake up because I forgot how painful it was. I can totally lift my arms above my head now without any pain. It is so wonderful. I am so glad that God gave us PT knowledge! I think I’m doing really well so far since last Tuesdays treatment. I am on Day #8 today and haven’t really had any side effects except for the usually nail pain, intestinal issues, throat/stomach pain and foggy brain. I don’t think they have been as bad as the last 2 sessions. I am starting to have the bone pain today from the Neulasta shot (in my hips) and realized that the Claritin I purchased is 12 hour instead of 24. So, that might be why…I don’t know. It isn’t too bad yet and the doctor prescribed some pain meds this go around, just in case! But, I don’t like to take them unless I have to. I’m weird like that. lol! I haven’t said much about the menopause symptoms of chemo, but I have missed my period by several weeks (for the first time in my life) and experience MANY hot flashes throughout the day and night. It is awful. Night time is worse because it is cold right now at night and I get chilled after a hot flash and then I can’t sleep because I’m too cold. Then, the hot flashes cause me to get hot and it is a never ending night time battle. I wake up every 30 minutes to an hour now either freezing or sweating. I am pretty tired throughout the day from not sleeping good at night. I’m going to talk to the doctor about it next time I see him. I can’t think of anything else “new”. I am happy to say that I’m not experiencing anything too bad this treatment and I’m praising God for all your prayers! One thing I want to mention though is that when I am having issues each day I try to “fix” it on my own and forget that I am just a prayer away from comfort. Stupid me will go a couple days in pain from intestinal issues before I realize that I haven’t even really prayed about it. Duh! Then, I pray and God answers. I should be praying for these symptoms every day, but I get caught up in them and forget that I’m not here alone in this. My Comforter is just waiting for me to ask. I need to lean on Him so much more than I do. My stomach and throat are starting to hurt a little so I just had cream of wheat for breakfast and no coffee (I miss my coffee!). Trying to drink clear liquids as much as I can, but I am behind. I was too tired to wake myself up to drink last night. Fingernails are starting to hurt like they always do and my mouth is starting to feel like sandpaper again. These are all just the usual symptoms. Nothing too bad…just annoying. I had my Neulasta shot yesterday (only 1/2 a shot since my WBC was so high last chemo). Today I have another PT appointment. This week, I’m finally starting to feel a difference after the PT work. Not sure if I’m going to be able to drive myself this afternoon. I hate being a burden. My parents are driving down from Michigan tomorrow. I can’t wait to have my Mama here. Also, my dad will be able to help drive me to appointments if I need him. Very excited about their visit. That’s all for now. Brain fog is getting worse. First, I want to thank my mother-in-law, Judy, for taking her day off work and spending it with me during my 3rd chemo treatment on her BIRTHDAY. I felt so bad, but I didn’t want to be alone and Kevan had to work. She was so gracious to come and sit in an uncomfortable chair all day. I know that it brings back memories for her during her two breast cancer journey’s…sitting in that same room…going through the same thing….but God was with her and brought her through it TWICE. I’m so thankful he did so I would know this special woman. I noticed a couple times that she had tears in her eyes for me and I’m sure it was because of the memories too. Judy, I love you and I have been blessed by God to have such a wonderful mother-in-law. I know this is a special blessing because not many can say this about their in-laws, but I was blessed with great ones that love the Lord as well. Thank you so much for all you do for Kevan and I.
Judy and I arrived at the Sarah Cannon Cancer Center at 10am. I didn’t get called for my blood work until about 10:30. It was a pretty packed out place…which is sad since most of us were their for our chemo treatments. I weighed even more this time when they weighed me…I hate it. Next time they are probably going to have to use the 2nd big weight and that has never happened before. :o( Anyway, they took blood out of my finger for my blood counts to make sure I could have chemo. Then, we met with my doctor and his nurse assistant about 15 minutes later. He said my White Blood Cell counts were very high due to the Neulasta shot and commented that my bones were working overtime. Mine were 44,000 and normal is 4,000 to 10,000. (I’m sure it was everyone’s prayers for me! Thank you!) So, because of the bone pain in my pelvis, hips, shoulder and sternum he is going to 1/2 the dosage this time (Praise the Lord!!!). This was happy news to me. The chemo nurse told me that they half the dosage in about 1/4 of their patients because their body reacts very well to the Neulasta shot and because those patients usually experience a lot of bone pain. I’m always such a special patient. lol! My doctor even commented yesterday that my body is VERY sensitive to the chemo, the drugs they give me and the shot. He also commented that I needed to start exercising on my good days since my weight is up. I guess I’ll start using the treadmill that just sits in our living room instead of just hanging my purse on it. lol! After we met with the doctor I go to the chemo room and find a chair I like. They are all recliners which makes it really nice. Although, Judy (or Kevan) have to sit in a normal chair and I’m sure it isn’t comfy. I arrived in the chemo room about 11am. Once there, the drugs get ordered. I get 4 total (steroid, anti-nausea, cytoxan and taxotere – in that order). The steroid and anti-nausea meds take a little over an hour to drip. Then, the cytoxan was about 30 minutes and the Taxotere about 1 hour. So, a little over 2 hours for all. So, I want to get started as soon as possible. Before I start the next section…if you have cancer and will be having chemo….get a PORT. I wanted one, but my doctor didn’t want to put me through another surgery and he thought my veins would be just fine. We didn’t realize at the time that I would be in the hospital twice so far and my veins would not cooperate at all. So, my advice to you…to make your life so much easier…is to GET A PORT! I should’ve demanded it. I took a quick pic of myself in the chemo room (again, we aren’t supposed to so I look funny in it since I didn’t want to get caught smiling at my camera. lol). First thing they have to do is my IV. One thing I am very tired of during this journey is the needle pricks. I already have scar tissue in 2 of my veins from the chemo and she told me that they can no longer use those veins for IV’s. I want to say that I know that the following is in NO WAY the nurses fault. My veins were not co-operating on my left arm yesterday. I wanted to use my left arm only since my right arm is already showing lymphedema signs and the specialist told me not to use the right arm. So, please…no comments about the nurses. They are a blessing to me and I was praying the whole time for them and me. I believe that God wanted me to go through this for some reason because he wasn’t answering my prayers. So, this was just part of his plan for me. Anyway, the first nurse tried to get a good vein. She noticed right away this wasn’t going to be easy so she got a hot pack to see if she warmed my arm if they would appear. She had to prick me twice (about 20 minutes apart), but both times the veins wouldn’t cooperate. So, she turned it over to another nurse. She tried once in another spot. Didn’t work. Then, the chemo room was getting VERY busy so she asked another nurse to try. She tried 2 times to no avail. I was getting emotional because it is pretty painful to get pricked so many times and know that it was going to keep happening until it worked. The tears started to fall which I think really bothered the nurse because she didn’t want me hurting. I tried to hide it, but I noticed everyone in the chemo room could tell I was crying. Sometimes I hate being an emotional girl! She suggested a little break. At this time, they had been trying for about 1.5 hours so far. They were really trying hard and not doing it too quickly so they wouldn’t hurt me if they didn’t have a really good vein option. I started to drink more fluids to see if it would help. Then, I told her to go ahead and use the right arm. I’ve NEVER had a problem with the right arm. I was also able to talk with an older woman next to me who had breast cancer and then 5 years later cancer re-appeared in one of her PET scans on her spine and liver. She is currently doing a clinical trial. There was a lot of commotion with her (due to vital checks, EKG breast, etc) so I wasn’t able to get her name or give her my info, but I will definitely be praying for her…God knows her name. She also complimented me on my hair and told me it was a very stylish haircut. 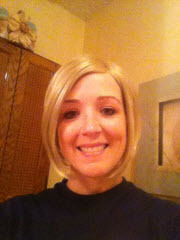 Then, I broke the news to her that it was a wig. LOL! A young boy (about 16 or 17) came up to me at the end of his father’s chemo and told me that he hoped my next chemo would not be so bad and that they would find a vein quickly. He said that he had been quietly praying for me and as he left he said “God Bless You”. What a blessing! I told him God Bless you too as he was leaving the room. Such a sweet boy! I will be praying for them as well. I’m hoping to see them again so I can talk to them some more during my next treatment. There were a few other women in the back of the chemo room that also came up to me and told me they were sorry about my vein experience that day. I didn’t realize so many realized what was happening since the room is so busy, but I guess when you are sitting there bored for so many hours and something interesting is happening everyone notices. lol! I finished chemo at about 3:45pm. So, we were at the Cancer Center for about 5.75 hours. A long day. It was great to get out of there, but I wanted to say that I know it is hard for those nurses that have to watch so many get chemo every day (the same ones and new ones as well) and to go through the hardship of people like me with bad veins who don’t have ports. They are all so sweet and I do appreciate them. After chemo my MIL grabbed me some lunch (Lime Slush and breakfast burrito from Sonic. Ha!). Then, we drove back to my MIL’s house and shortly after met up with some other family members for dinner. I wanted my MIL to at least have a special dinner on her birthday. So, we took her to the Old Spaghetti Factory in downtown Nashville. I was already starting to feel the brain fog and I was a little off balance already which I was really sad about. I wasn’t able to eat much as I felt like I was gagging on my food. It was strange. After dinner we drove the 1.5 hour ride home. I had the bright idea of starting my raisins and prunes ritual earlier than I normally do after chemo. Usually I wait 4 days and my intestinal issues are already so bad that it takes several days of pain to get back to normal again. So, we stopped and got some from a store and I ate about 2 Tablespoons of raisins and 1 prune (I didn’t want to over do it…usually I eat 3 to 4). Anyway, we went right to bed when we arrived home at 10:30pm. I woke up at 2am from really weird dreams that I was about to get sick. I laid there for about 15 minutes before I realized that there was no going back to sleep. The intestinal issues were starting earlier this time (Day 2). I was in a lot of pain. My intestines were cramping and talking back to me. lol! So, I spent the next 3 hours in the bathroom. Either on the toilet or laying in the floor. I found if I walked back to the couch and got comfortable I had to run right back to the bathroom…so I just laid in the floor in there. My kitty Stormie laid next to me like she knew Mama didn’t feel good. It was sweet. I don’t know if this episode was caused by the raisins/prunes or if it would’ve happened anyway since it always does at some point after chemo. I’m just glad that about 5:30am I was feeling much better. I made sure to drink some water since I really need to make sure I’m flushing out the chemo. Then, I laid down and was able to sleep until a little after 6:30am. So, I think I was able to sleep at least 5 hours. Which is a huge blessing since after my first chemo I only slept 3 hours. I didn’t post the time for chemo #2, but I think it was 7 hours. Today is a very special day. August 8th! My hubby’s birthday. My doctor calls him “Husband of the Year”. He really is. I am so blessed that God brought us together almost 10 years ago. He took the day off today so that we could do something for his birthday. I love you sweetheart! We have the day planned around my PT appointment and picking up a new license plate for the car. My prayer for today is just that my side effects will stay away long enough for him to have a special birthday. I’m already feeling weak and off balance so I’m trying to pray away those too. Here is a picture of us from the overlook where we got engaged. 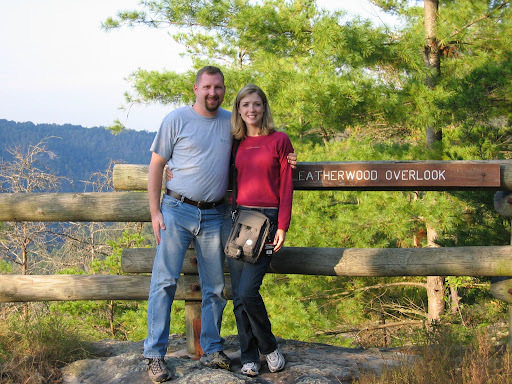 This was our 1 year anniversary hike (I was so thin and had hair!). Again, thank you all for your prayers and for your encouragement. You all are a blessing as well. Over the last few months, during my journey, I have had several people comment regarding “my suffering”. I’m not sure why, but the term “suffering” bothers me. I do not feel like I’m suffering. Mostly, I feel like I am on a journey. A journey of sanctification, learning, compassion and hope. Of course, I go through days when I’m in a lot pain, I get discouraged and lose sight temporarily. But, after a day or two I’m doing a lot better. I can see the end and rejoice that the Lord brought me through it and I’m thankful of the things I’ve learned or experienced along the way. Also, I know that God does not see things the same way that we do. Someone might think something is “bad”, but God sees the whole picture and knows that it is “good” for us. Just like when you start an exercise program after a long time of being lazy (like me. lol! )…you struggle in the beginning, the day after you can hardly walk…you struggle with continuing, but in the end you tone up, you look better and you feel great….but you had to do a little “suffering” along the way. I looked up suffering in the dictionary. It says, “to feel pain or distress.” I guess “technically”, it sounds like I’m suffering since I do experience pain or distress during this journey. To me I think of suffering as a day in and day out (long term) type of trial. Even though I have been on this journey for several months there are so many blessings and good days along the way. I also know in my heart that “my suffering” is only temporary. It may sound strange, but I’m thankful for the experience. Without the trial I wouldn’t see the blessings and I wouldn’t be changed. I’m definitely being changed. When you watch someone go through a trial and you have never experienced the same trial you can only have sympathy for that person. You feel sorry for them. But, when you go through the trial yourself you have compassion. 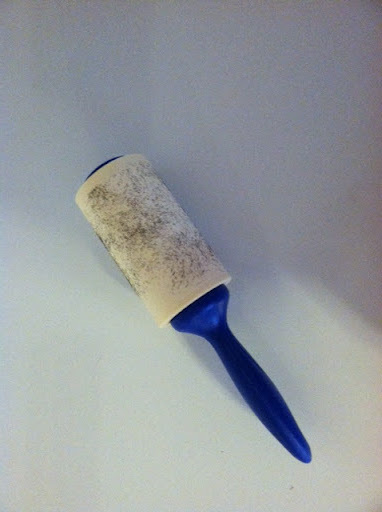 You’ve been through it. You can cry with them and they will know that those tears are tears that carry the same pain that they are experiencing. I love that I can hug them and share with them what they are going through because I know. Sympathy is very different than compassion. Whether it be sickness (cancer), loss, divorce or some other trial…if you’ve been through it you KNOW what they are going through. So, don’t feel sorry for my “suffering” since I’m not sorry. I am learning what it is like to go through a major surgery, have drains put it and taken out, make friends with my scars, go through chemo treatments, struggle to get through a day, have major pain, etc. But, most of all, I’m learning to depend on God each and every day. This doesn’t mean I don’t need prayer. It is through your prayers and your support that I’m able to get through this trial. I see the blessing of so much support from my husband, my family, my church, friends, co-workers, etc. Through your support and giving of yourselves I know how to give to someone else going through a similar experience. Yes, I am even being taught through your support of me during this trial. If you believe in Jesus Christ and call on His name, His grace is sufficient. He will provide you with the grace you need. He will walk with you through your trial and the Holy Spirit will comfort you when you need comforting. He may not take you over the mountain when you ask Him to, but He will provide you with what you need to get through it. If you do not know Jesus and want to know more about Him, click here. If you wonder why you should believe in Jesus Christ and how to know if He is real, read this pamphlet and it may help answer some of your questions. In the bible, in Romans 5 it says, “Therefore, since we have been justified through faith, we have peace with God through our Lord Jesus Christ, through whom we have gained access by faith into this grace in which we now stand. And we boast in the hope of the glory of God. Not only so, but we also glory in our sufferings, because we know that suffering produces perseverance; perseverance, character; and character, hope. And hope does not put us to shame, because God’s love has been poured out into our hearts through the Holy Spirit, who has been given to us,” (emphasis mine). I have seen and felt God’s love being poured out during this journey. It is amazing. I know I’m not through this journey yet. I have 2 more chemo treatments and my final reconstruction surgery. But, I can look back over the last few months and see the Lord carrying me through it and I know He will be with me through the rest of the journey. I also know that those that love me will continue to encourage me and pray for me until the end. My cup is full. My heart rejoices in this “suffering” because without it I wouldn’t have experienced so many blessings, so much love, so much encouragement and so much teaching. This isn’t suffering. This is grace. I’m learning to depend on God to provide me what I need.